The Liberal government is planning to implement a new legal Indigenous framework that includes building a new relationship with First Nations, Inuit and Metis. During a speech in the House of Commons Wednesday, Prime Minister Justin Trudeau said the goal of the framework is to lead to self-determination and the “full and meaningful” implementation of treaties and agreements. “With this framework, we have a chance to develop new tools to support the rebuilding of Indigenous communities, nations, and governments; and advance self-determination, including the inherent right of self-government,” he said. Trudeau said the framework would replace policies around comprehensive land claims and the self-government “with new and better approaches that respect the distinctions between First Nations, Inuit, and Métis peoples. 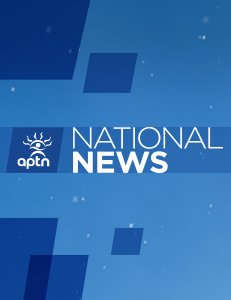 The Minister of Crown-Indigenous Relations will lead “national engagement activities” throughout the spring to determine the contents of the new framework. It should be introduced later this year and implemented by October 2019, the Trudeau government said. NDP MP Romeo Saganash Indigenous said there was “hope” from Trudeau’s words but Indigenous people have waiting too long for Canada to keep their promises. “We need to make sure this time it is for real,” said Saganash. 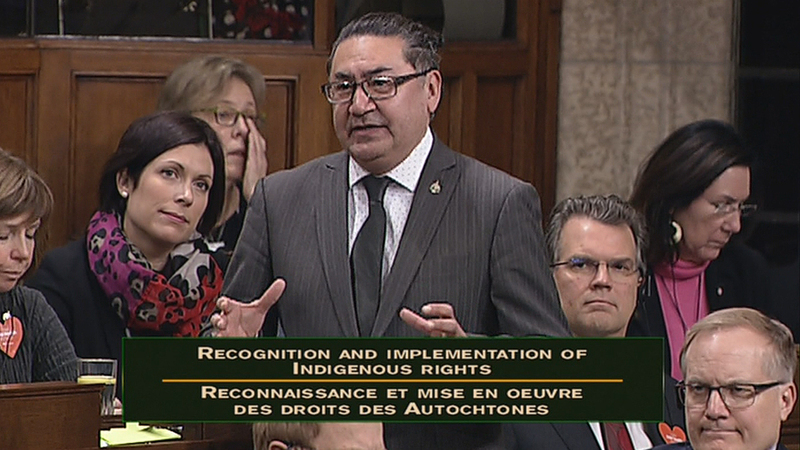 NDP MP Romeo Saganash speaks in the House of Commons Wednesday. The news comes after a Saskatchewan jury delivered a not-guilty verdict in the shooting death of 22-year-old Red Pheasant First Nation member Colten Boushie. The Friday verdict spurred cross-country rallies calling for changes to the criminal justice system. “I just finished up a series of town hall visits in communities all across Canada. And everywhere I went, there was at least one person who wanted to know what our government is doing to combat racism, to help advance reconciliation, and improve the quality of life for Indigenous Peoples. “There were questions about fishing rights, and land claims, and pipeline approvals. 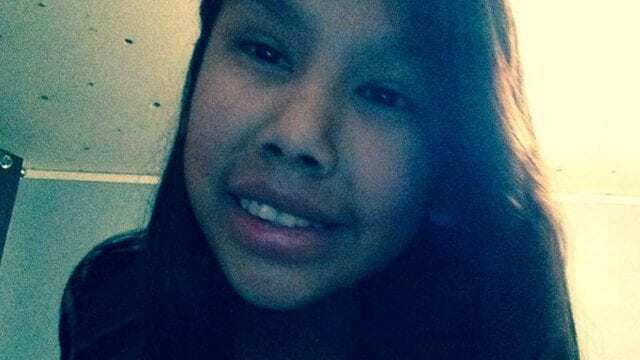 Questions about the national inquiry into missing and murdered Indigenous women and girls, about clean water, and about the alarming number of Indigenous children in foster care. “One of those questions is how we, as a government, recognize and implement the rights of Indigenous Peoples. We’ve seen those questions grow in number and intensity in just this past week, as more and more Canadians come to grips with the fact that we have so much more work to do. “Yesterday, I had the honour of spending some time with Colten Boushie’s family. With his mom Debbie, cousin Jade, and uncle Alvin. “And through all their grief and anger and frustration, their focus was not on themselves and the tragedy they have endured, but on how we must work together to make the system and our institutions better. Better for Indigenous youth, for Indigenous families, and for all Canadians. “We have a responsibility to do better. To be better. To do our best to make sure that no family has to endure what they have gone through. “Mr. Speaker, the criminal justice system is just one place in which reforms are urgently needed. “Reforms are needed to ensure that – among other things – Indigenous Peoples might once again have confidence in a system that has failed them all too often in the past. “Last year marked 35 years since Aboriginal and treaty rights were recognized and affirmed through Section 35 of the Constitution Act. “You might recall, Mr. Speaker, that the government of the day – led by my father – did not intend to include these rights at the outset. “You see, Mr. Speaker, the challenge – then and now – is that while Section 35 recognizes and affirms Aboriginal and treaty rights, those rights have not been implemented by our governments. The work to give life to Section 35 was supposed to be done together with First Nations, Inuit and Metis peoples. And while there has been some success, progress has not been sustained, or carried out. And so over time, it too often fell to the courts to pick up the pieces, and fill in the gaps. “To truly renew the relationship between Canada and Indigenous Peoples – not just for today, but for the next 150 years – we need a comprehensive and far-reaching approach. We need a government-wide shift in how we do things. “We need to both recognize and implement Indigenous rights because the truth is, Mr. Speaker, until we get this part right, we won’t have lasting success on the concrete outcomes that we know mean so much to people. “Indigenous Peoples in Canada should be able to drink the water that comes out of their taps. They should be able go to sleep in homes that are safe, and not overcrowded. Indigenous children should be able to stay with their families and communities, where they are known and loved. “All of these things demand real, positive action – action that must include the full recognition and implementation of Indigenous rights. We need to get to a place where Indigenous Peoples in Canada are in control of their own destiny, making their own decisions about their future. “And so today, I am pleased to announce that the government will develop – in full partnership with First Nations, Inuit, and Metis people – a new Recognition and Implementation of Indigenous Rights Framework that will include new ways to recognize and implement Indigenous Rights. “Mr. Speaker, Indigenous Peoples and all Canadians are ready for change. Ready for a new relationship based on recognition, rights, respect, co-operation and partnership. With a Recognition and Implementation of Rights Framework, we can build that new relationship, together. “It won’t be easy, Mr. Speaker. Nothing worth doing ever is. But it will be worth it. It will be worth it because we will have taken more steps toward righting historical wrongs. International UN Law, including The United Nations Declaration of Indigenous peoples, is underpinned by UN Terra Nullius Laws. These Terra Nullius Laws are hidden in Resource extraction and land appropriation laws that protect the rights of states over non-states (Indigenous Nations) exclusively. In my personal opinion, the UN’s forked-tongue and dog-whistle deceptive legal rhetoric needs to be addressed more broadly. Too many Indigenous People are victim to the smoke and mirrors decoy process of UN mediation. Too many Indigenous people peoples are led into falsely believing that the UN is a neutral 3rd party. The process is rigged against Indigenous Peoples, just like Federal or Provincial Terra Nullius laws undermine Indigenous Title and Rights. Cut from the same cloth. UNDRIP is positive in that it supports the rights of Indigenous Peoples to be consulted and self-govern their own land and peoples. However, UN law supports that after the due process of consulting Indigenous Peoples is excercised, states still having the final say over Indigenous land and peoples, especially regarding economic development of land and resources. The general reaso is that appropriation of Indigenous land, by the state is in the public interest of the non-Aboriginal state majority over the rights of the Indigenous minority. This is the conjuncture where Human Rights violate Indigenous Human rights, and Title. It is not my intent to remove Indigenous hope in a negotiation process with the UN or Canada by writing this. However, with the best interest of Indigenous Peoples in mind, I am simply saying the Canadian government’s proposed interest in replacing the Comprehensive Land Claims process, and building up a self-government framework, does not remove the states core ideology of real sovereignty extinguishment objectives. Also UN law supports that the state retains political presedencies over Indigenous sovereignty. Indigenous peoples will have to fairly compromise, like Canada will have to, in order to reach final agreements that are fair. But fair requires more translucency, to reduce extortion.